This is the second in our book reviewer Steve Pressman’s series of posts on Thomas Piketty’s Capital in the 21st Century. Piketty pandemonium continues, relatively unabated. Capital in the 21st Century reigns on Amazon, holding either the #1 or #2 spot most of the time. Everyone seems to want on the Piketty bandwagon. People are talking about the book and everyone seems to feel compelled to say something about it. I feel rather privileged to now be part of this phenomenon. For the first time in my life I think am beginning to understand what Beatlemania was all about in the 1960s. Before reading Piketty’s book carefully, I thought it would be worthwhile to summarize and synthesize some early reviews. For those interested in more of this, and in getting a different take on these early reviews, Brad Delong has been summarizing and critiquing reviews on his website (http://delong.typepad.com/). Unfortunately, as far as I can see, there is no single place on Brad’s website to find all his reviews of the Piketty reviews. Roughly, the reviews fall into four main groups—(1) critics who come at Piketty from the right, (2) critics who come at Piketty from the left, (3) reviewers who heap a great deal of praise and mainly praise on the book, and last as well as least, (4) reviewers who have not read the book. These categories do overlap. Many praising the book overall alsofound quite a lot to criticize, just as some critics found quite a lot to praise. But the largest overlap seems to be between the critics on the right and those reviewers who did not read the book. I begin with the reviewers that do not seem to have read the book since these are the most fun to refute and to mock. Part 2 of my review of reviews will discuss the positive reviews, and should appear in a few days. Part 3 will focus on some of the more critical reviews of Piketty from the left. Hands down, the award for the best review of Piketty’s book by someone who didn’t take the time to read it must go to Megan McArdle of Bloomberg View. McArdle is the clear winner because she begins her review by admitting that she didn’t read the book. Certainly, she gets lots of points for honesty but she gets no points for writing a good review. After summarizing a few opinions from other reviews, McArdle goes on to talk about what she wants to talk about—the hell with Piketty and his book. McArdle’s main criticism of Piketty is that his policy solutions “won’t help the middle class”. She takes Piketty’s policy solutions to be the government “writing checks” to middle-class households and putting the middle class “into government make-work programs”. My guess (from having read lots of reviews and also some early work by Piketty) is that this is not what Piketty advocates at the end of his book. More damning, and contradicting what McArdle contends, my work on the middle class has shown that both across countries and in one country over time, progressive income taxes and a wealth tax (policy solutions pushed at the end of the book, according to many reviews) would help the middle class. Progressive taxation is one main reason the Nordic countries have a large middle class and the US has such a small middle class. Moreover, despite the complaints of many (see below) a progressive income tax is not socialism; even Milton Friedman favored a progressive negative income tax. And a progressive income tax does not necessarily mean taxing away all the income of the rich; it only means that the rich (who can afford to pay more) are subject to higher tax rates than the poor and middle class. Furthermore, given that most other taxes are regressive in nature (they tax lower income households at higher effective rates), a progressive income tax is necessary if we are to have something resembling proportional taxation in the United States. 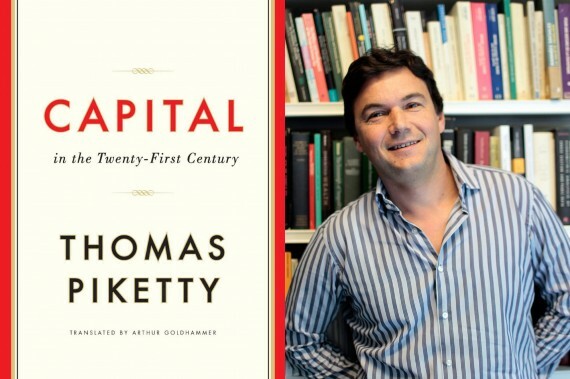 Like McArdle, many critics of Piketty from the right also seem to have not read his book. Ross Douthat, in his op-ed column in the New York Times, even hints that he and other conservatives attacking the book have not really read it. Yet, he still thinks he understands the argument well enough to proclaim that “Karl Marx is back from the dead”. Likewise, James Pethokoukis in The National Review proclaims that Piketty is some sort of Marxist. These are people who do not seem to understand either Marx or Piketty. Yes, there is a superficial similarity—both Marx and Piketty see problems with capitalism. But who doesn’t see problems with capitalism after the Great Recession? Using this criterion, almost everyone is a Marxist or some sort of Marxist. As Jedediah Purdy writes in theLos Angeles Times of April 24th, what Piketty has done is to show that the problems with capitalism that Marx identified have not disappeared; they remain and they must be addressed. The important questions are the causes, consequences and solutions to these problems. They are among the most important questions of our day. On these issues Marx and Piketty differ substantially. At a less superficial level, Piketty does not seem to hold a labor theory of value, one central doctrine of Marx. But problems run even deeper with the Marxist name calling. There are important substantive issues that divide Marx and Piketty; these concern what causes problems under capitalism, how serious these problems are, and whether the problems can be remedied. Marx identified the problems with capitalism as stemming from employment relationships, and as serious because they run counter to what it means to be human and because wages would always be forced to bare subsistence levels while competition forces down the rate of profit forcing firms to increase their exploitation workers. Moreover, Marx did not think that the government policies could resolve these problems because they were inherent in capitalism and would inevitably lead to its demise. In contrast, for Piketty our main economic problems come from the arena of finance (which generates higher returns than the growth of the real economy) rather than production relationships, and he sees this problem as less serious than the problems Marx identifies since Piketty thinks real wages can continue to rise as the relative wages of average workers declines. Finally, as many reviewers have pointed out, the last section of Piketty’s book talks about how to resolve the problem of rising inequality. So, unlike Marx, Piketty doesn’t see rising inequality as an inevitable economic problem or a problem that will lead to the overthrow of capitalism. Three strikes and you should be outed—Piketty is no Marxist and these reviewers don’t seem to have read Piketty. Many reviews on Amazon.com also fit into the category of reviewing a book you have not read. People seem to have heard that Piketty complains about rising inequality and wants to raise taxes on the rich, so they lash out immediately. Some of these one-star Amazon reviews were reprinted in the New York Times on May 4th in a failed attempt at being humorous. Several reviews on the Amazon webpage for Piketty’s book called it “socialist garbage” or something similar, but did not go beyond name calling. Many reviews lambasted Piketty as a hypocrite for not giving his book away for free. One Amazon review (giving the book 3 stars out of a possible 5 stars) complained about the kindle edition being hard to read; another reviewer gave the book 1 star and complained about the kindle price for the book. One of my favorite reviewers on Amazon gave the book 3 stars; the reviewer noted that they had not yet read the book, but probably would read it soon. Is this Andrea McArdle taking yet another shot at Piketty? One really strange review gave the book 1 star claiming it was “banker propaganda” because it did not advocate a 100% reserve requirement for banks. From what I have read of the reviews, Piketty is not a friend of affluent bankers by any stretch of the imagination. He recognizes that they their pay is not market determined, but determined by their friends who get appointed to the bank compensation committee. Capitalism in the Twenty-First Century does not seem to be banker propaganda. Despite such negative reaction from the right, the book has done rather well on Amazon, averaging 3.5 stars (based on 323 customer reviews). To provide some perspective, 3.5 stars is the average rating on Amazon for Jami Attenberg’s much heralded The Middlesteins (see my previous post on Piketty’s book); but it is below her best-rated book, Instant Love, which has averaged 4 stars. John Kenneth Galbraith’s The Affluent Society has an average rating of four stars. Paul Krugman’s popular books generally get an Amazon rating of 4 stars. Freakonomics, another popular book dealing with economics comes in at 4 stars on Amazon. Free to Choose and Capitalism and Freedom by Milton Friedman both average 4.5 stars. One of the ratings winners in economics, I am proud to say, is my book Fifty Major Economists, which has an average close to 5 stars. I really hope that I have not just jinxed myself by mentioning this! I must admit that I can’t remember anything quite like the reception of Thomas Piketty’s new book Capital in the Twenty-First Century. It seems as though everyone is reviewing it, and everyone seems to have an opinion about the book. Remarkably, most of these opinions have been extremely positive—even people who do not agree with Piketty’s conclusions. Even more amazing is the fact that an economics book with lots of graphs and some equations has made it to the New York Times bestseller list. John Kenneth Galbraith and Milton Friedman frequently achieved this feat, but they wrote for the educated public in clear and simple language. Their bestsellers did not have pages and pages of tables and graphs. And there were no mathematical equations to scare away readers. Even more amazing, Piketty’s book is currently (5/4/14) in the #1 position on Amazon and has been at #1 (or close to #1) for several weeks. The Piketty phenomenon therefore appears to be something of an entirely different order of magnitude than the popular work of Galbraith and Friedman. It is almost as if wonky and technical economics has become hip. Or, perhaps, Piketty’s book has hit a raw public nerve. And he has managed to achieve all this without a book title like Fifty Shades of Income Distribution. I only recently obtained a copy of the book, and plan to read it carefully in May and then review the book for Dollars & Sense. The review is slated to appear in the September/October issue. I approach these tasks with great anticipation and some trepidation. Reading lots of reviews before reading a book has its benefits as well as its costs. The main benefit is that I know when a book receives rave reviews in lots of places. For me, this is a signal to buy and read. I have discovered lots of wonderful books and authors this way, and have read many great books that I otherwise would have never known existed. Jami Attenberg’s recent novel, The Middlesteins, which received a splendid review on the front page of the Sunday New York Times Book Review (as well as several other places) early last year, is a good example of this. While the book was centered a bit too much on food obsessions for my tastes, the writing style as well as the characters and humor made it clear to me that Jami Attenberg was a writer with immense talent and worth paying attention to. As a result, I read her three previous novels last summer. The best of the lot (which I recommend very highly), Instant Love, is also the book that received the highest customer ratings and best reviews on Amazon (there will be a connection to this in my next post). One downside to reading lots of reviews is that it is easy to be disappointed when a book doesn’t turn out to be as good as all the reviews claim and so doesn’t live up to your very high expectations. I felt that way with The Middlesteins to some extent. Another downside to reading lots of reviews is that you start reading a book with a certain mindset and read the book from a certain perspective. Such blinders are hard to take off. I worry about this regarding Piketty’s new book. Yet, the case of Piketty’s new book is a bit different from the case of The Middlesteins. When I read The Middlesteins, I did not know who Jami Attenberg was and was not familiar with her previous work. However, I have known and admired the work of Piketty for some time. One can easily crown him as the economist of Occupy Wall Street (and Occupy other places). His painstaking empirical research has shown that the top 1% (really it is the top .1%, those making nearly $2 million a year) received most of the economic gains in the US during the past several decades. At the same time, knowing his previous work and writing on income inequality a great deal, I am aware of some key data limitations and thus how one can question the conclusions drawn from the numbers. So I go into this with some biases, some preconceptions and some blinders; but I do acknowledge that they exist and will try to fight them as I grapple with a book that seems profoundly important. Laying out all my biases, here is how I approach reading Piketty. From the many summaries in various reviews, it is seems that this book presents the lots of data to demonstrate that most of the income gains over the past several decades have gone to those at the very top of the income distribution (something that has not been questioned, although it probably should be), an explanation of why this has been the case (something that many reviews have questioned), and a set of policies to deal with rising inequality (something that most reviews have had problems with). I am about ready to take the plunge and try to come up with my own assessment of this book. I will be blogging while I am reading. But first (in another few days) I will say a little about the many reviews that have already been written on Piketty’s book.